Compared to David Gray's previous release, "White Ladder," this is a superb album. "White Ladder" had anywhere from one to three good songs, at best, and his new release, "A New Day At Midnight" has a whole album full of well thought out, well written, well produced songs. Leading off the album, is one of my personal favourites, "Dead In The Water." His lyrical repetiton makes the song perfect in every way. The other stand out songs, are "Caroline," "Freedom," "Real Love," and hit singles, "Be Mine" and "The Other Side." 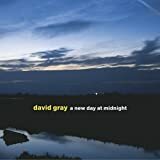 If you are looking for an artist with a lot of talent, and with music that you can just relax and smile too, David Gray's "A New Day At Midnight" might be a great buy. David Gray has done it again. He's crafted an album that is heart-wrenchingly beautiful, insightful, and fun to listen to. As with his breakthrough album, White Ladder, David utilizes his acoustic guitar, a piano, and synthetic beats to take the listener with him on a very personal, sincere ride through the depths of his emotions. The ride begins with "Dead in the Water," a contemplative look at human nature, sinks to "Freedom," a depressing lost love tale, rises to the almost silly "Be Mine" (which actually features the line "Jumpin' Jesus, holy cow! "), and quickly descends to the depths of his very personal sadness with the closing song "The Other Side," a tribute to his late father. A New Day at Midnight is a fantastic soft pop album that features some truly majestic lyrics, and David's vocals are all but breath-taking. David's debut album, A Century Ends, remains my favorite of his six albums, but A New Day at Midnight pushes extremely hard at its heels.